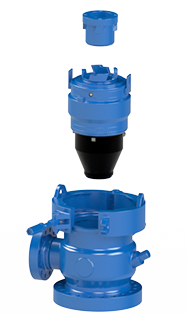 The Washington Series 1300 is our original Rotating Control Head. This unit is designed to seal off the drill string components continuously and divert all cuttings and debris away from the rig. Designed Top Head and for Kelly Drive rigs, these units can handle up to a 5 1⁄4″ Hex and 4 1⁄2″ Square. Bore sizes are listed below and most are stock items. The 1300 Series Control Head utilizes our 1024 Stripper Rubbers and will seal off all drill steel from 2″ – 8″ OD. We have a well stocked inventory of parts and excellent service to keep down time to a minimum.